WC doesn’t want to be perceived as neglecting the distaff side of the throng of Republican presidential wannabes. There is a woman running, of course, a woman whose resumé would give any modest person – male or female – reason to hesitate before appearing in public. 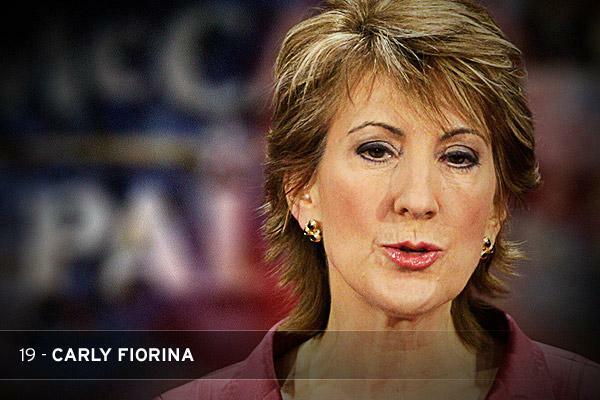 WC refers, of course, to the inestimable Ms. Carly Fiorina. And then there is Hewlett-Packard. Yale Management Professor Jeffrey Sonnefeld called her time there the worst tech CEO performance in history. He was especially critical of “her ruthless attack on the essence of this great company,” noting that “she destroyed half the wealth of her investors and yet still earned almost $100 million in total payments for this destructive reign of terror.” And that’s without mentioning the 30,000 employees she laid off at H-P. WC thinks that her forced merger of Compaq and H-P is a textbook illustration of why you never, ever force a merger. And that her $21 million golden parachute is another example of her utter selfishness. Today, H-P is a shell of its former self. So there’s her record. A series of bad decisions at Lucent. A series of even worse decisions at Hewlett-Packard. In both cases, decisions that nearly killed the companies. And a failed campaign. Her defenses to these facts are largely non sequiturs. She compares herself to Steve Jobs, another fired tech executive. But Jobs came back to Apple and made it the largest corporation on the planet. Ms. Fiorina hasn’t worked in the private sector since being sacked at H-P.
Not what WC is looking for in the President of the United States. I caught Fiorina’s interview with Chuck Todd on MTP the other day. When asked about her lies regarding the alleged video she saw and its having come from Planned Parenthood, she responded with her usual b.s. about harvesting the brain of a supposedly aborted fetus which she claimed had to be done while it was still alive. Removal of the brain will obviously be the equivalent of a deceased fetus yet her spinning the process as “harvesting the brain while still alive” only serves to make the idea sound more gruesome for the RWNJ’s base, which of course means they’ll use this type of speech all the more frequently in order to anger the base and get those donations coming. Fiorina insisted the tapes were out there, ignored the fact that they were proven not to come from PP and were not from an abortion but was actually the video of a stillborn infant who was deceased, therefore, no kicking legs or beating heart as Fiorina claimed nor was there any accompanying sound that talked about harvesting the brain from the stillborn fetus. In fact, there was no sound at all. Fiorina also talked about her record at HP, claiming that it had been distorted by the media and yet when asked why she was never offered another CEO position, she claimed she had been but obviously offered no proof of the same. As WC noted above, the only thing Fiorina has to show since her epic failure at HP, is a failed Senate campaign and her position as an assistant to McCain/Palin campaign which also failed quite spectacularly. How strange that Fiorina loves to brag about not being a member of the political class yet the only reason she’s able to use this as a talking point is due to failure to win her Senate campaign. How about those RW’ers, if it weren’t for double standards, they’d have no standards at all.